Refer to product flyer for the current grading specifications. ACDelco Select SAE LS140 is an all season , high performance LS hypoid gear oil for highly stressed normal and limited slip differentials in passenger cars, light & heavy commercial vehicles as well as agricultural and construction equipment. 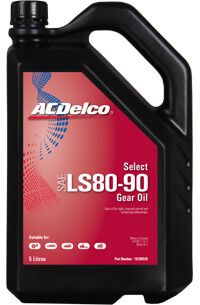 ACDelco Select SAE 85W-140 is a hypoid gear oil for highly stressed differentials and manual gearboxes As well as other crown wheel & pinion gears, steering mechanisms and distributor drives in vehicles and industrial machinery. Limited Slip Hypoid Gear oil for highly stressed normal and limited slip differentials in passenger cars, light & heavy commercial vehicles as well as Agricultural and construction equipment.